Lights out in St. Louie! 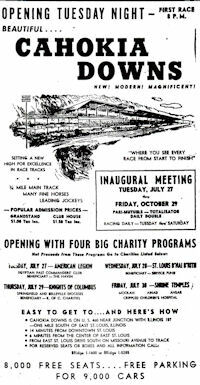 Cahokia Downs was part of the Southern Illinois racing circuit and shared dates with Fairmont Park which still runs a meet. Both tracks were noted for pioneering night racing in the fifties. Cahokia closed before the purse value index showed up in the Daily Racing Form but would have probably been a 4 meaning a lot of bottom level claiming races. For most of it's years Cahokia ran both a Thoroughbred and Standardbred meet. Cahokia Downs may not have been the safest place to visit in it's day. It was said you had a good day at the track if you came out and found your hubcaps gone and not the whole car. Then there was the night two bartenders left the track and were blown to bits when they started their car. The next night the track announcer who always cautioned patrons about their ride home said "and be careful starting your cars". Speaking of track announcers, two of the top announcers of the day, Dave Johnson and Tom Durken got their starts at Cahokia Downs. It's been over twenty five years since the six furlong oval with the long one and one eight mile chute that was tilted at a fifteen degree angle has held a horse race. The only indication that a track ever existed at the Cahokia site are two streets one named Racehorse Drive the other Harness Lane!